I'm looking for ways to improve the piston for my next rifle. So far I used a piece of pipe filled with epoxy and 2 O rings in the back. I plan on using it at or beyond 40 bar. Can UHMWPE even take that much? My idea is... pumping from the pilot area fills the pilot and opens the check valve, bleeding air into the chamber. I'm guessing that because of the check valve there will be a tendency for the air pressure to be slightly higher in the pilot area then in the chamber area. 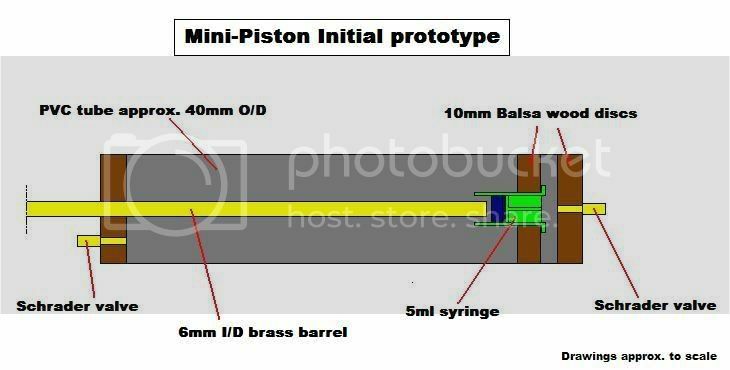 I know this will make for a perfect sealing piston and if I get a leak in the pilot area, pressure will not equalize and the gun will fire. I am currently building something almost identical to what your design, out of UHMWPE piston body, with a hole drilled and tapped into the back. I then have a short section of threaded rod with a large hole drilled in one side, and a very small through the other so they meet near the middle. The side with the small hole also has a groove in it so I can twist it into the piston with a screwdriver. The large hole in the threaded rod fits a 1/4" OD o-ring and a 6mm airsoft BB behind it, then a spring. Screw into the body until the spring begins to compress and voila! Or at least that's the idea. I drilled the hole for the threaded rod too far off-center, so when I went to cut the groove for the rear o-ring I hit the valve body. FAIL. Working on another right now. I highly suggest the threaded rod method, and another detail to simplify fabrication: Drill the hole that connects to the chamber directly into the area where the spring sits. UHMWPE should be fine, since it has an incredible impact strength and it won't be acting as a pressure vessel. EDIT: Wow that first paragraph sounds very excited... I feel out of breath proofreading it. Fabrication is easy enough for a lathe... the only hard part is the threads and getting the right O ring/O ring groove. I'll post pictures soon. I ordered a 4' section of UHMWPE from McMaster a few months ago, so I've been looking for good uses. I know fabrication's pretty easy for a lathe, but how do you put a hole like that into the piston without using a threaded rod? Wouldn't you have to cut it in half then put it back together? Pretty and it should work, but needlessly complex in my opinion, in the sense that if you remove the o-rings and simply have a solid piston with close tolerances you should have practically identical performance. The advantage that I've seen is that if one uses a very heavy or high-friction ammunition, there is a massive loss out the pilot valve during and even after piloting, while the ammunition is travelling down the barrel. A sealed piston would prevent this loss. My own thread. too many pictures, would clog up yours. saefroch wrote: The advantage that I've seen is that if one uses a very heavy or high-friction ammunition, there is a massive loss out the pilot valve during and even after piloting, while the ammunition is travelling down the barrel. A sealed piston would prevent this loss. I would disagree, unless your piston is significantly smaller in diameter than the chamber it travels in and you need a massive pilot to compensate. When I first started making piston valves they were basically like this, airtight syringe pistons with separate pilot and chamber filling valves. When I moved to cast epoxy pistons, the improvement in performance was noticable - of course the piston now wasn't 100% airtight, but the loss of friction more than compensated for this. In any case, why bother with a relatively complex check valve when, since you're using o-rings anyway, you can just have a floating seal? This is based on observation. I made a dart once (which I never managed to retrieve ) that was quite heavy, maybe even a pound which doesn't seem that heavy, but I was shooting it out of a .364" diameter barrel. There was close to a full second's delay before anything happened after I opened my pilot valve. The same thing happened to me when trying to create a visual display with flour, except the delay was perhaps longer. My piston is very nearly the same diameter as the space it travels in (i.e. it sounds like a high-powered hunting device without ammo). I'm operating at pressures where those silly things like weight and friction can pretty well be ignored. Only about the back 1/8th inch of my piston sits in the housing when it's sealed. Not the right design to do a floating o-ring with my machining facilities. And since my piston wedges itself into the stop every time I fire it, I need to kick it forward to get it into the sealed position. I don't know if a floating o-ring will survive a blast of 600psi air, and be able to crack at any reasonable pressure. I've heard of people using the sealing face as the check valve; all you do is drill a small hole under your sealing washer. when the air slams the piston back, the sealing face seals off the hole drilled through the piston. Get it? Lockednloaded wrote: I've heard of people using the sealing face as the check valve; all you do is drill a small hole under your sealing washer. when the air slams the piston back, the sealing face seals off the hole drilled through the piston. Get it? Yup..dead simple...but not worth a shite on a close ratio piston is it? saefroch wrote: My own thread. No washer in sight. All the ones I've used are far too weak. Even at 600psi they're either cut through by the sealing face or torn off and ejected down the barrel. Now that'd just be gilding the lily... but it doesn't address the problem I think FighterAce and definitely I are trying to fix. I will, however look into it, since I've got a good 3ms where my valve is open an even a light projectile is still travelling down the barrel. If I do... I think I'd need epoxy. If I rammed my piston into an o-ring or other fairly deformable material with ~176 pounds of force (the instant before impact) seated in epoxy, would it crack the epoxy? Floating O rings and sealing face as check valve are just too slow... if I want to build a powerful piston valve that's piloted by a schrader or some other low flow push button valve, the check valve needs to at least be helped by a spring. I am already using the bumper as a seal JSR. The problem is that when you pump air into the pilot area, it doesn't bleed into the chamber if the piston is sealing 100% to the housing. And if its not a 100% then the schrader wont open the valve because of its limited flow. If I made it a solid piston with close tolerances, I'd need to pump slowly in order to let it equalize and that is just not acceptable. Is this what you are trying to solve as well, saefroch? Aside from being too complex/time consuming to build... are there any other major disadvantages or flaws? I guess I should beef up the threads joining the 2 halves. FighterAce wrote: I am already using the bumper as a seal JSR. The problem is that when you pump air into the pilot area, it doesn't bleed into the chamber if the piston is sealing 100% to the housing. And if its not a 100% then the schrader wont open the valve because of its limited flow. I use solid pistons with close tolerances and I can assure you that I don't have to pump slowly, with my shock pump (which I only use of hybrids these days ) by the time I get to the next stroke the pressure has already equalised.